On this day in 1895, William Vacanarat Shadrach Tubman was born in Harper, Liberia. Tubman is known as the “father of modern Liberia,” serving as its 19th President. Tubman’s grandparents were part of a group of 69 slaves who were freed from slavery in Augusta, Georgia and sent to live in Liberia by Emily Tubman, a philanthropic woman. This all-handmade quilt, titled “Liberian Star,” was made by Leona Johnson of Monrovia, Liberia in 1992. From the Quilt Index record: “The quilt was brought to Flint, Michigan by the maker’s sister’s son, Rev. Emmanuel Bailey. Emmanual goes to Monrovia, Liberia about every 6 months to see his relatives and to work on the building of an orphanage for the victims of war.” The quilt was purchased along with one other by Johnson for the Michigan State University Museum Collection. On this day in 1997, Lilian Leigh Eselgroth, was born in Durham, North Carolina to Amy Milne and Chris Eselgroth. Mrs. Karl Schegel machine pieced, hand appliqued and hand quilted this 39” x 40” “North Carolina Lily with Flying Geese” quilt between 1850-1875 in Detroit, Michigan. 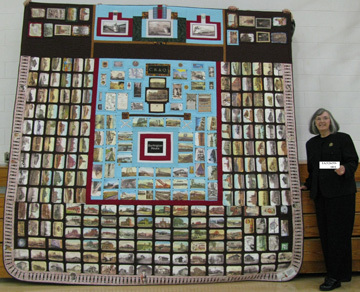 The quilt was documented as part of the Michigan Quilt Project and is owned by the Detroit Historical Museum collection, one of the more than 250 historical societies and museums represented by quilts in the Index. Happy Sweet Sixteen to my Carolina Lily, and Happy Thanksgiving to all! On this day in 1957, Caroline Bouvier Kennedy was born, daughter of U.S. President John F. Kennedy and First Lady Jacqueline Bouvier Kennedy. She was named after both her maternal aunt, Caroline Lee Bouvier Radziwill, and her maternal great-grandmother, Caroline Ewing Bouvier. Young Caroline inspired singer-songwriter Neil Diamond to write his hit song “Sweet Caroline,” first released in 1969. On this day in 1862, mathematician Charles Lutwidge Dodgson (aka Lewiss Carroll) sent 10-year-old Alice Liddell a handwritten manuscript called “Alice’s Adventures Under Ground. Alice and her siblings, the children of one of Dodgson’s colleagues, loved to hear Dodgeson’s stories and insisted that he write them down. Barbara Kilbourn of Ann Arbor, Michigan made this 42” x 42” quilt, titled “The Dance,” in 1996 for the American Quilters Society Show in Paducah, Kentucky. The quilt is Kilbourn’s original design and was machine pieced and appliqued and machine quilted. Kilbourn documented the quilt as part of the Michigan Quilt Project. There’s a lot to love about Thanksgiving: delicious food, the presence of family, the sharing of gratitude, the after lunch nap. But this week’s Q.S.O.S. Spotlight features one of my favorite parts of Thanksgiving: Turkey! From an aptly named quilt pattern to rework embroidery to a special international quilt swap, we’re celebrating all things Turkey today at the Quilt Alliance. You can read more quilt stories (with and without turkeys) on the Quilters’ S.O.S.- Save Our Stories page on the Quilt Alliance site. On this day in 1963, John Fitzgerald Kennedy, the 35th president of the United States was assassinated while traveling through Dallas, Texas. Kennedy was the youngest man elected President (at age 43) and the youngest to die in office (at age 46). J.F.K.’s favorite hobbies were sailing, swimming and football and among his favorite pets were ponies. The quilt was documented during the Texas Quilt Search Project and is included in the book Lone Stars: A Legacy of Texas Quilts, Vol. II, 1936-1986, by Karoline Patterson Bresenhan and Nancy O’Bryant Puentes (Austin: University of Texas Press, 1990.) 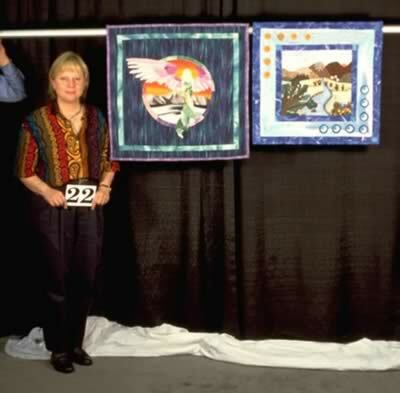 It was included in an exhibition by the same name at the International Quilt Festival, in Houston, Texas in November, 1990. Additional information about Retta Booher Holland and her daughter Kathleen McCrady can be found in Kathleen H. McCrady, My Journey with Quilts: Over 70 Years of Quiltmaking 1932-2003 (Austin: 2005).